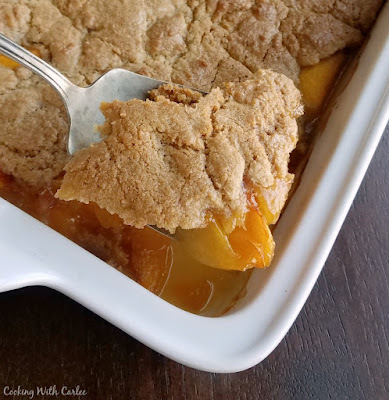 The warmth of brown sugar married with the goodness of peach cobbler. 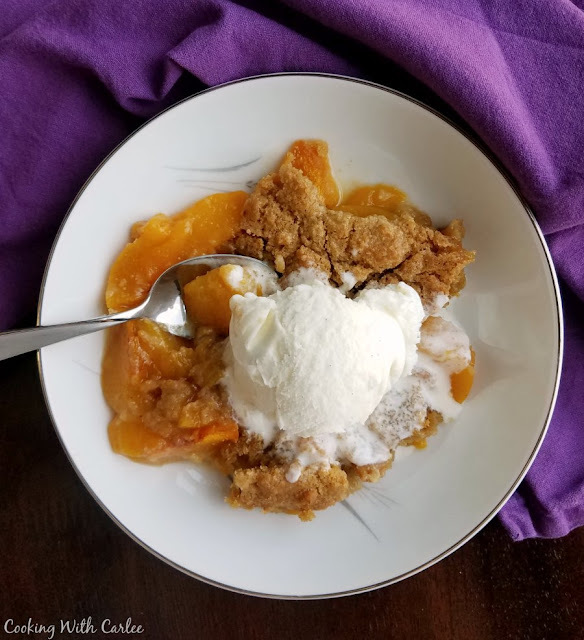 The brown sugar peach cobbler has a hint of cinnamon and makes the perfect landing pad for a scoop of ice cream! Sometimes you just need a little peach cobbler. A la mode, of course! There is just something comforting and delicious about the warm fruit and simple topping with a bit of melted vanilla ice cream seeping into it! As much as I love desserts like this, when I was asked for a recipe I found that I don't have a single cobbler posted. I have a great recipe for peach breakfast cake, that could probably be considered a distant cousin. There is also a savory cobbler with tomatoes, parmesan and basil. But there is no true cobbler on my whole site. Well, you know that peaches immediately went on my shopping list and the wheels started turning. If I was going to post a peach cobbler, I wanted it to be a little bit different than what was out there already. That is always a bit of a tricky needle to thread with a classic recipe like cobbler. I don't want to duplicate what's already out there, but don't want to change it so much that it's not recognizable. Luckily it didn't take me long to decide what my little touches would be. I love cinnamon with peaches, so of course there had to be some of that. Also instead of a plain white biscuit or cake like topping, I just knew brown sugar would add a little extra warm flavor that we love. Peaches aren't in season right now, so I used two pounds of frozen peaches. Just defrost them and go ahead and keep any of the juices right in there, that is part of the good stuff after it bakes! If you prefer, you could use a couple of large cans of peaches. Drain some of the liquid, but it's ok to leave a little. Again, that's what makes some of that good stuff under the crust! I also used white whole wheat flour. It just so happened to be what I grabbed first when I went to the pantry and I thought, why not? Actually I love the way it worked out, any extra nutty flavor only went to enhance the warmth I was trying to create with the brown sugar. But all-purpose would work just as well! I love a lot of fruit in my cobbler. If it's a peach cobbler, I want the peaches to be the star. But if you like a lot of crust, you could easily make either 1 1/2 or even double the crust recipe. You may have to add a couple of minutes to the baking time, but otherwise you could follow the same directions and I'm sure it would be wonderful. Of course we had to eat it warm with a scoop of vanilla ice cream. There's really no better way in my opinion. However I'm sure maple whipped cream or even some cream cheese whipped cream would be lovely. How do you like your cobbler? Do you have a favorite recipe? Preheat oven to 350 F and grease a 9x13" pan or 12" cast iron skillet. Spread peaches over bottom of prepared pan and set aside. If you like your fruit filling to be really sweet, you may want to sprinkle a couple of Tablespoon of sugar or cinnamon sugar on the fruit at this stage. In a mixing bowl, cream the butter, brown sugar and sugar until light and fluffy. Mix in the egg and vanilla until well blended. Stir in the flour, baking powder, cinnamon and salt until just combined. Drop or spread the dough over the peaches. Bake cobbler for 40-45 minutes or until the crust is golden and the fruit is bubbly. Allow to sit for about 10 minutes and then serve warm with a scoop of ice cream. You are so right about that, sometimes you do just need a little Cobbler!! My goodness I love peaches and brown sugar so much! This is perfect in every sweet way! Happy Monday brilliant lady, hope it’s great! Oh, yes please, Carlee!! Love the brown sugar twist!! Hi Carlee, this is what us English would call a proper pudding! Warm and comforting. I love cinnamon in almost anything and brown sugar does add a nice taste too. It's only recently I've started seeing white wholewheat flour, it's not something that's reached here yet. Hooray! You could definitely use all purpose flour or regular whole wheat if you'd like. The white whole wheat is just a more delicate whole wheat made from a different variety of wheat. Mmmmmm This sounds so perfect right now! This will be delicious with fresh peaches this summer. 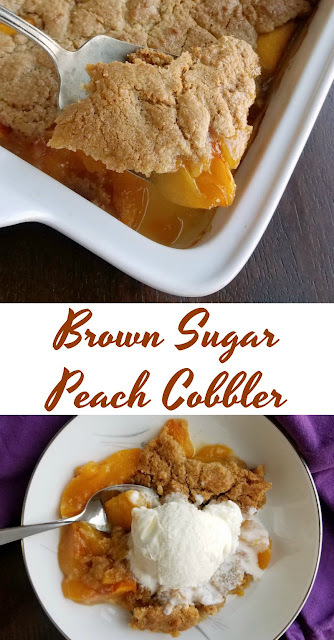 The brown sugar peach combination sounds delicious! I can't wait for peach season! Thanks! This is my idea of the perfect dessert...with ice cream of course!!! Yum! I can't wait to try this! I love making special desserts like cobblers in the spring and summer. Looks delicious. You know cobbler isn't something I was really brought up with - crumble, yes, but not cobbler - but think we should add into rotation. It's a fun change to have the different texture! 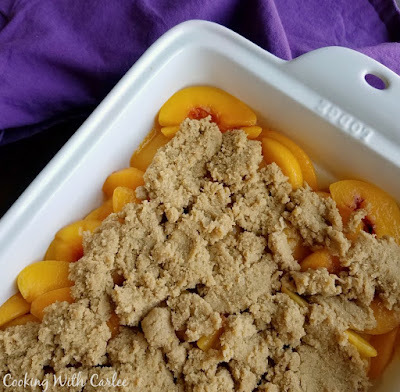 My go to cobbler is apple or blueberry, but I'm definitely down to try this beautiful peach recipe! Mmm, now I want blueberry cobbler! 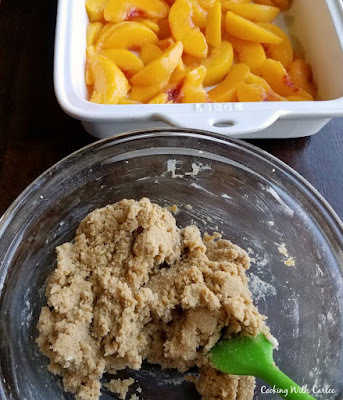 I love peach cobbler, but I've never made it using brown sugar. It looks delicious! I'm going to try your recipe the next time I make it. Thanks for sharing at Snickerdoodle, Carlee. I'll be featuring this at tomorrow's party. Hope to see you there! I hope you love it! Thank you and see you there! I need this. Asap! If I knew husband would be home for dinner, I would bake this tonight. But, I don't want to eat the whole pan myself! 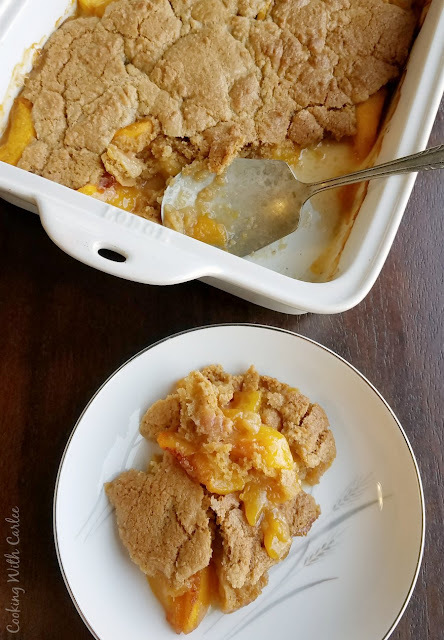 We always love a good fruit cobbler and peach is one of our favorites. The brown sugar is a keeper for me and I like that you used whole wheat flour. The al a mode is just a bonus! Your picture is so pretty too. Thank you for sharing this recipe. Oh!! Yummy!! this one looks and sounds wonderful Carlee. I love the idea of brown sugar. Thanks for another great and esay one. WOW this was so good and such a crowd pleaser. My friend told me it´s the best dessert she has ever had. One thing, though, is that my topping did not cook all the way through so I would cook it at a lower temp and for longer next time. Thank you! !